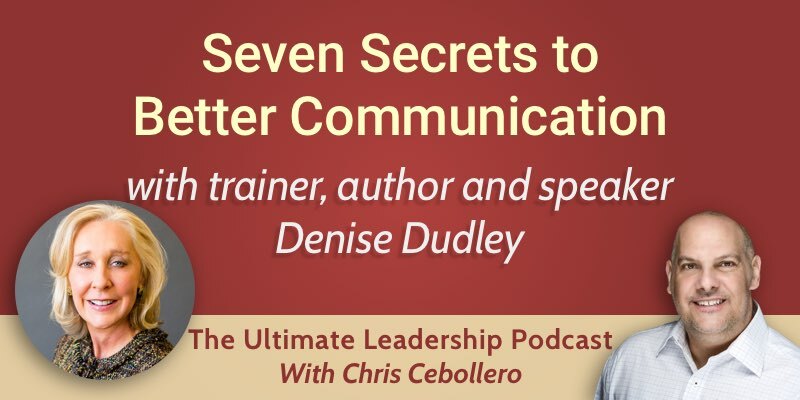 We are joined by author and coach Denise Dudley who shares her seven communication components to ensure state-of-the-art communication and maximize your success. How important is eye contact? Oftentimes people assume that communication will happen naturally. In order to be a really great communicator, we need to study our communication skills. Denise teaches seven communication components. The first one is facial expression. Initial research showed that the first impression occurred in 10-15 seconds after talking to someone. Recent research has discovered another first impression that occurs in under one second. This impression is based on facial expression. When you first look at another individual, the best facial expression to have is a neutral-to-positive open facial expression. How important are eye contact and posture? Denise’s second component is eye contact. We should mostly make eye contact, but we should break it a little bit every once in a while. If we stare at someone and never look away, we tend to come off either as aggressive or attracted to the person. The third component is your posture. We should make sure our posture is straight and erect, shoulders back. Posture will communicate to people whether we are interested or engaged, or even reliable. In order to make a positive impression with your communication skills, you need to control your handshake. When we are shaking hands with someone, we are offering the person visual, tactile, and auditory information about ourselves. A handshake communicates whether you are assertive, passive or aggressive, or whether you are glad to be there. The just right handshake is firm but gentle. Along with the handshake, you are making direct contact, smiling and saying your name. The fifth component is about your hand movements. You should use your hands to describe and elaborate. If you are nervous and fidgeting with your hands, put them on your side. You shouldn’t touch your face or your hair if you are sitting at a table or in a group. The sixth component is voice tone. It communicates whether you are feeling powerful or sure of the message you are delivering. If we want to sound powerful and assertive, we should stay in the lower ranges of our voice tone. Women tend to speak a bit higher. They have a widely varying intonational pitch pattern. That means that women like to go up and down the scale. The seventh component is loudness. A lot of people are too soft or too loud, and it becomes too distracting to the listener. If we are too soft, people are making an effort to hear us. It is the speaker’s job to look for feedback in the listener to make sure they are loud enough. We should also pay attention to our content and avoid using verbal crutches. These are repetitions of “um…” or “you know”. It’s more powerful to be silent than to use fillers because they take away your credibility or your power. In order to become a great communicator, you have to practice, practice, practice.